My recent discovery of the old photograph of alpinists made me dig out one of the first postcards I ever picked up from the 10p box. I was instantly attracted to the man looking at the glacier with his hands behind his back; he looks so small next to the immense block of ice which has sat there for millions of years. I wonder if he is dreaming of roesti and wurst or how amazing mother nature is. I started investigating this glacier as I was intrigued to see if it still existed. I remember climbing up some precarious wooden stairs to see a small, crystal-blue glacier in Switzerland about 9 years ago and then reading some years later how it had disappeared. 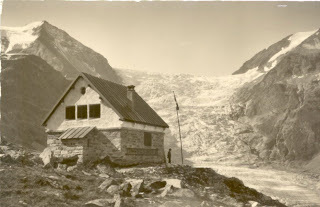 It is a strange feeling to know a glacier that existed for so long has now melted away. Anyhow, I am glad to say this one is doing well.